Platismatia glauca (L.) W.L.Culb. & C.F.Culb. 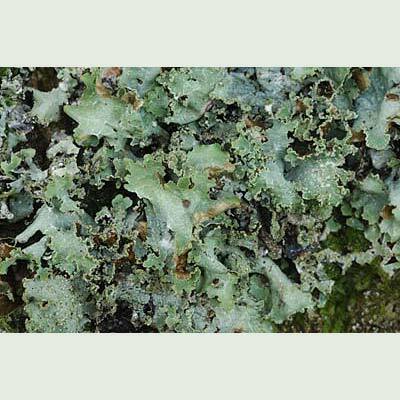 This large, grey-green, foliose lichen with its lobes (c. 4cm long) crisped like curly kale or broccoli forms spreading tufts on acid-barked trees near wet ground and on boulders in the uplands. The upper surface and edges of the lobes are covered in ridges that bear stick-like projections (isidia) that can wear away to powder (soredia). The underside is pale or white, blackening towards the centre. Discs are rare. It is scattered throughout most of Ireland, but may be scarcer in the south-west. This corresponds to its scarcity in south-west England and absence from the Channel Islands. Tuckermannopsis chlorophylla is similar but brown, smaller and not so frequent. Simms, M. J., (2016). Platismatia glauca (L.) W.L.Culb. 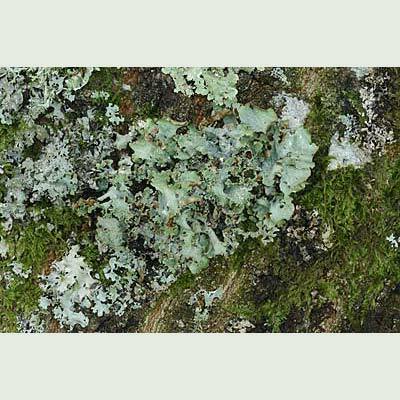 & C.F.Culb.. [In] LichenIreland.